Billionaire businessman Mike Ashley is on course to withdraw football club Newcastle United from the stock market after lifting his stake to 77.06%. Mr Ashley said he would push ahead with plans to raise his stake to the 90% or more needed to force the remaining shareholders to sell their stakes. He bought a 41.6% stake from the family of Sir John Hall through his company St James Holdings Limited in May for £55m. Mr Ashley runs the Sportsworld chain and Lillywhites. Newcastle is the latest club to succumb to a takeover as investors are lured by the world's richest football league. In the past few years, investors, mostly from overseas, have swooped for clubs including Manchester United, Liverpool, Aston Villa and West Ham. 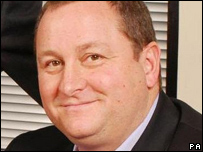 After buying a 41.6% stake in the club, Mr Ashley launched a £133.1m ($263m) offer for Newcastle. The 42-year-old later convinced chairman Freddy Shepherd to sell his 28% stake in the Premiership football club - a purchase that was completed on Friday. The club, famous for its black and white strip and Magpies nickname, parted company with previous manager Glenn Roeder on 6 May. Former Bolton boss Sam Allardyce was named as his successor on 15 May and has since signed striker Mark Viduka from Middlesbrough and Manchester City midfielder Joey Barton. Scott Parker, Titus Bramble, Antoine Sibierski, Craig Moore and Olivier Bernard have left the club as Allardyce rebuilds a team that finished last season in 13th place in the Premier League. Allardyce and former Newcastle boss Graeme Souness were both named in Lords Stevens final report into alleged transfer irregularities, published on 15 June. The report suggested a perceived conflict of interest with Allardyce and his former agent son Craig when Sam was in charge at Bolton Wanderers. Stevens also reported "inconsistencies in evidence" provided by the former Newcastle boss Souness and Kenneth Shepherd, son of Magpies chairman Freddy Shepherd.